However, the decision was made and we sold off our trusty old PA and replaced it with new generation digital equipment. 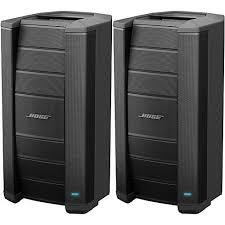 Because of the outstanding service we have had from the “802 speakers” it was an easy step to stay with Bose and a pair of “Bose 812 flexible array” loudspeakers were purchased. Now all we needed was a mixing desk to complement these powered units. After much research, the decision to go for a “Allen and Heath QU16 was made. 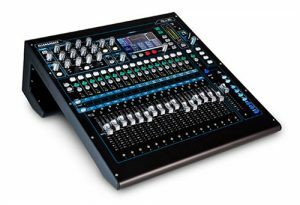 The QU16 is the perfect mixing desk for making the transition from analog to digital. We no longer need our racks of power amplifiers, our flight cases full of FX racks, or even our 60 meter copper cable multicore and stage box, weighing in at far more than it is reasonable to expect one man to lift. Allen and Heath QU116 Chrome. And the best news of all……….. we no longer need a Transit van to transport the system to the gig!!! In fact, all we will ever need (and much, much more) is built right into the desk. The unit also has a multi channel recording facility so now it’s easy to make a multi-track recording of the gig and download it to your computer DAW at a later date for mixdown. Another terrific feature of this mixing desk, is the network control. Wireless iPad control from anywhere in the room, very handy when setting up stage monitors, not to mention virtual sound check. Do we like our new system? …………………… Crystal clear reproduction from a very powerful, compact, light weight feature rich PA. Connection to stage box via. 120 meters of “Cat5” cable. Feedback is now a thing of the past. Transport the whole system in one car…………… Yeah, we love it! Next Next post: Peterson Strobe Tuner.